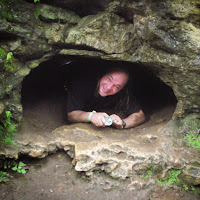 Back in 2014, shortly after I first started designing games, I stumbled upon a website called the Meeple Mechanic that, among other things, posted short interviews with game designers. I used to love these interviews, but over the years the site evolved and changed and the interviews were part of the past. So in 2016 I started my own People Behind the Meeples series of designer interviews, which is coming upon 100 interviews. I love reading about what drives other people to design games, and what their other interests are. So when I had the chance to take look at Wizards of the Tabletop, I jumped at the chance. Just a few of the games and designers featured in the book. 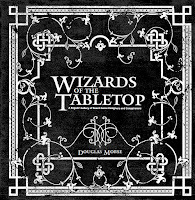 Wizards of the Tabletop, by Douglas Morse, is a kind of book that is right at home on the game table, rather than the coffee table (although it'd be great there, too). This large, 12" x 12" book is filled with gorgeous pictures and short, but interesting pieces about some of the biggest names in modern board games. 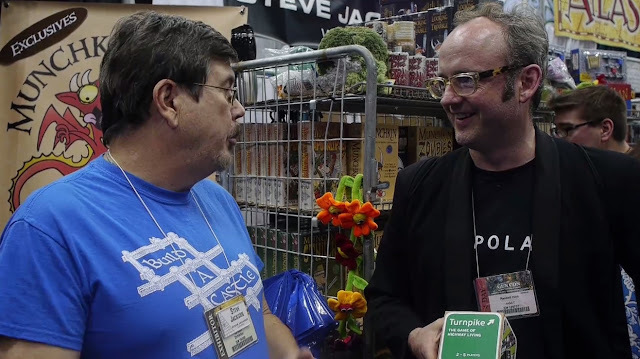 You'll recognize some of the most famous designers, including Alan R. Moon (Ticket to Ride), Reiner Knizia (Tigris & Euphrates), Richard Garfield (Magic: the Gathering), Jamey Stegmaier (Scythe) and tons more! There are also features on other personalities in the business, like Wil Wheaton (Tabletop), Brittanie Boe (GameWire), Scott Alden (BoardGameGeek), and more. Of course Andy and Kristin Looney have a feature! Coupled with these fascinating blurbs is a wealth of incredible photographs. There are great photos of all of these personalities as well as some awesome shots of some really awesome games. These are gallery quality portraits, and gorgeous views of games,but there are candid shots and convention photos, too. Interspersed within the designer and game profiles are other short articles, too. There's a very nice three-page summary of the history of modern board gaming, from 1900 to the present, plus some speculation on what's to come in the next few years. A few companies, like Funagain Games and The Broken Token have highlights, too. The Broken Token is featured with their inserts for Scythe. Most books have a short blurb about the author or editor right at the end, but Wizards of the Tabletop moves that a bit away from the last pages. It's still toward the end, but Douglas Morse has made his own contributions to the tabletop games community, too. Starting with his impact as a player, and culminating in, not only this book, but also his The Next Great American Game documentary about the process of looking for a game publisher, Douglas has his finger on the pulse of the tabletop game community. Regarding The Next Great American Game, you'll also find a bit about Randall Hoyt in Wizards of the Tabletop. Randall was also responsible for the graphic design and layout of the book. And guess what, I have a special bonus for you! After my Final Thoughts, I'll include a mini review of The Next Great American Game as well as the bonus features that are available with the movie. This is truly a great game table book. It's gorgeous to look at, both inside and out. The information is presented in easy-to-read, brief articles that can quickly be read between turns or while waiting for the next game to start. While this isn't a must have item, it is a definite boon to any gamer's collection. The cover looks stunning and the 12" x 12" dimensions mean it'll fit perfectly on your game shelf next to some of the games featured in the book, when it's not out on your game table, that is. The book is the same size as many of the square box games you'll have in your collection. While the interviews don't go into a lot of depth, they're perfect to give you a quick background and insight into the designers, publishers, business owners, and personalities that populate the tabletop game community. It's great to see and read about how personable, passionate, and inspirational these true masters in the art of tabletop games can be. 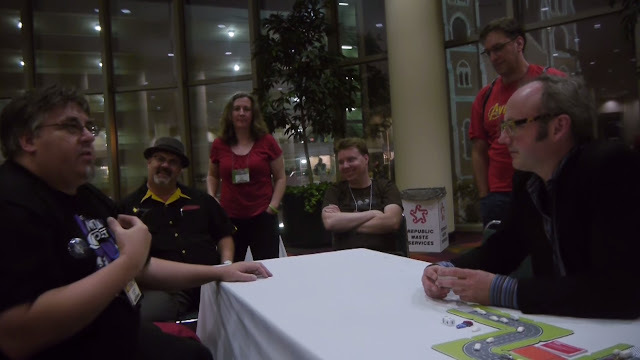 In my People Behind the Meeples interviews, most of the designers aren't yet very well known. All are aspiring to be of the caliber of the names in this book, and someday hopefully some of them will. Plenty already have published games that may be on your shelves. One thing I've learned from my interviews is that game designers come from all walks of life, have vastly different experiences, occupations, families, and backgrounds, and find their inspiration and techniques in a myriad of different places. One thing unites them though, and that's the excitement of seeing other people having fun playing the games they've created. I haven't yet met a game designer that isn't friendly, helpful, and just an overall nice person. It's great to see from Wizards of the Tabletop that even the biggest names in the industry are cut from the same mold. Where else would we find Alan R. Moon, except on a train? 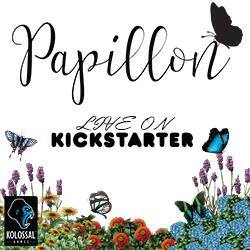 If tabletop games are your passion, this is a book that you'll love. If you know someone who loves tabletop games, then this would be a unique, thoughtful gift. Keep that in mind for the gamer in your life this holiday season, especially if they're running out of room on their shelf for more games! OK, so I'm not Robert Ebert, but I'll do my attempt at a movie review. 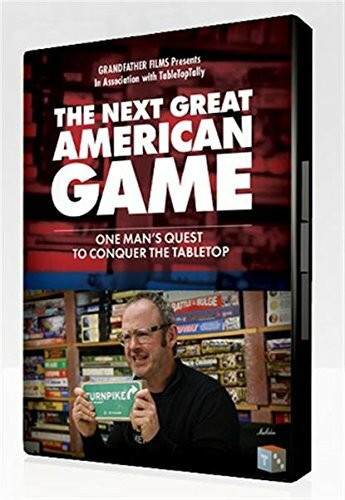 In addition to Wizards of the Tabletop, Douglas Morse also sent me a download copy of his documentary, The Next Great American Game. 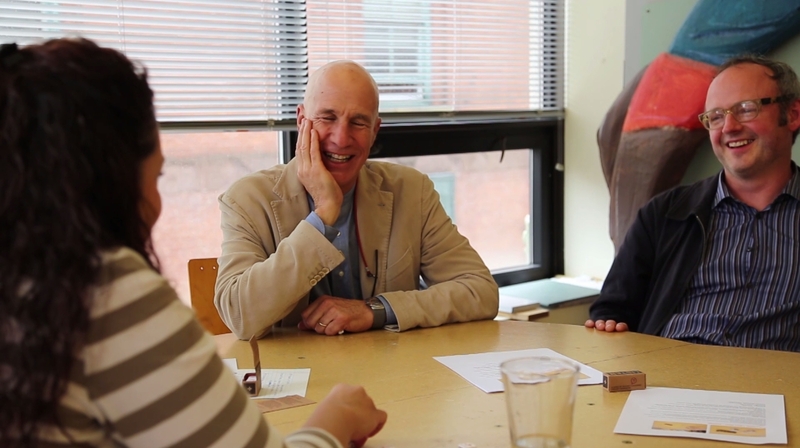 In The Next Great American Game we follow graphic design professor Randall Hoyt around the country for about a year in his attempt at finding a publisher for a game he designed, called Turnpike. At the start of filming, Randall had no experience with modern board games. His experiences were with the traditional, mainstream games that we all grew up with; Monopoly, Sorry, The Game of Life, etc. By modern board game standards, these games have some serious flaws, and unfortunately, Turnpike was a design that came directly from that family of games. Yes, it had some new mechanics that set it apart from those classics, and that's why Randall felt that his game was better, but it still suffered from many of the flaws that modern games have found great solutions to. Making a common mistake among new designers that are not familiar with the modern tabletop game industry, Randall was pitching his game as the next great American game (which also gave the film its title). Describing your game as such to a publisher is an immediate red flag indicating you are someone who is out of touch with the industry, as Randall definitely was. However, through the documentary we watch Randall learn and grow. He learns what publishers are looking for, and especially what they're not looking for. He has a number of setbacks, but each time uses that as a learning experience on how to pitch better, how to improve the game, what the public is looking for, what makes a game fun and exciting, and what causes a modern gamer to lose interest. Pitching a game unannounced, on the floor of a convention is probably not the best method. By the end of the movie (minor spoiler here), Randall has improved his game and actually has something that has gained some interest. The movie ends saying that Randall is still looking for a publisher for Turnpike. If you read through Wizards of the Tabletop, you'll find out (another spoiler) that he was actually successful in finding a publisher! In 2017 Jolly Roger Games and Ultra PRO published his game as Road Hog: Rule the Road. I found it interesting that Douglas Morse chose to follow someone around that had so little experience in the industry. At first I almost felt like the movie was a cruel joke on someone that was obviously an outsider. I felt bad for Randall for the situations that Douglas put him in (it was obvious from the film that many of the publisher interviews for Randall to pitch his game were set up by Douglas and his team). Often he was turned down without any sugar coating: "You made an '80s game for the year 2013. So good luck on your '80s game, I hope you find a time machine to go with it." Despite it all, Randall remained optimistic and pushed on. James Mathe of Minion Games was his usual to-the-point, no-holds-barred self and didn't have much positive to say. But it is fun to see friends of mine in the video! Hi Gary and Vicki! Eventually he began listening to the feedback he was getting. He made changes and updates to the game, and the responses he started getting were more positive. It was at this point I realized the genius in finding someone like Randall to follow, and help get those audiences with publishers. Douglas must have recognized that Turnpike had the spark of a good idea and wanted to see what it could turn into. In the process, he made a documentary that shows the trials and tribulations of seeking a publisher for a game, all the way from pure disappointment through to the rays of hope. During the movie we come to know Randall as a person, possibly more than we'd hope to know, and the struggles in his life outside of getting a game published. By the end you feel as if you're rooting for a friend rather than watching someone you don't know anything about. This is just the beginning of Randall's journey; the movie doesn't follow through to see Road Hog: Rule the Road get published. (Maybe there's a sequel coming out? I don't know.) However, it's enough to inspire anyone to keep pushing, to pursue their dreams, and to never give up. It's also a great educational tool to see what you should do before pitching a game to publishers, or presenting any idea to a company in any industry. Namely, do your research and learn about the industry you're pitching to, make sure what you have to offer is something the industry wants, be excited about your product yet humble at the same time, and take feedback constructively. Quality wise, the film suffered from some areas that were difficult to hear because of background noise, but that lends itself to the homegrown nature of the video and really gives you a sense for how distracting a convention environment is, and why it's not a good idea to pitch right in the middle of the action. The noisy parts didn't detract from my enjoyment, but did have me pause and back up a couple of times so I could re-listen to what was being said. Also, the segments on Talk + Listen seemed a bit disconnected from the rest of the story. It was interesting, and ended up tying in more by the end, but when that game turned up about halfway through the movie it felt out of place and a bit jarring. A few earlier mentions of that, or a better segway would have helped tie in that side story better. Randall working with a team, discussing options for how to package Talk + Listen. 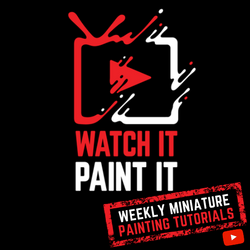 There are also about 3 hours of additional videos available (more on the deluxe version), featuring interviews with designers, like Matt Leacock, Antoine Bauza, Bruno Faduiti, and more. Want to know how Rampage (now Terror in Meeple City) came about? Are you curious about how Steve Jackson went about creating the big box version of O.G.R.E.? All of this, and tons more, can be found in the extra footage. These are great bits that go into a lot more detail than anything in the book or movie. They're worth the price on their own! The extras include some really great interviews with HUGE names in the industry. The movie isn't for everyone though. Plenty of people don't like documentaries, and even for those that do, this isn't Discovery Channel production quality. It is a close intimate look at a pretty niche process in a niche industry. I'd say Wizards of the Tabletop is a book that can be enjoyed and appreciated by pretty much any board gaming fan. The bite-sized chunks of information are great for casual fans. The Next Great American Game, though, is probably best for those die hard board game addicts interested in how the industry works, or those that really like documentaries. 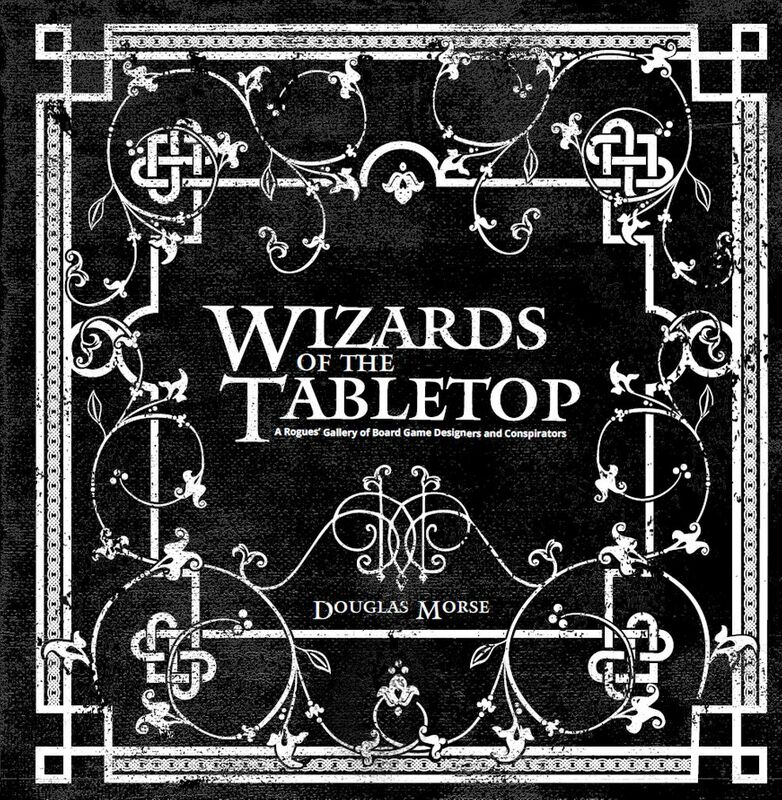 In all, though, both the book and movie are great peeks into the world of tabletop games, and I can't wait to see what comes next from Douglas Morse.